OPP IOT has created a new industrial RFID tag designed to withstand temperatures as high as 280°C for limited exposure times(280°С for 50 minutes, 250°С for 150minutes). This very compact tag, only 42mm x 15mm in size, is designed to be easily mounted in as many locations as possible and complies with the open EPC Class1 Gen2 and ISO18000-6C standard. 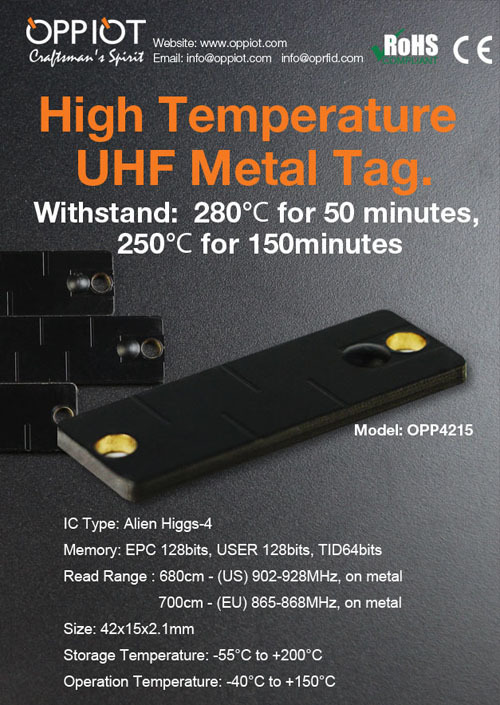 The high-temperature tag OPP4215 is commonly used for applications where users need to track parts and get traceability of the manufacturing process. This is needed for quality improvement and error proofing, as well as maximizing the reusability of product carriers like pallets or conveyor segments. A typical application is painting and coating operations where heat sealing, oven drying, or curing may occur. In this type of application, the data carriers are not active during high-temperature exposure and therefore data is reliably preserved. The tag allows unlimited reading and writing of data with user memory up to 128 bytes. Integrating all popular communication protocols, this high-temperature RFID data carrier can communicate with all popular control platforms. Compatible read/write heads are available in many sizes and configurations to fit most applications. OPP IOT can develop RFID tags to meet your unique material property or specific environmental requirements.